This past Friday, Simon and I spent the day in Sacramento. We visited one of my favorite nurseries in town, bought some beer making supplies, and shared some delicious beers on the patio at Pangaea Brew Cafe. We ended a great day at Masullo Wood-Oven Neapolitan Pizza restaurant. 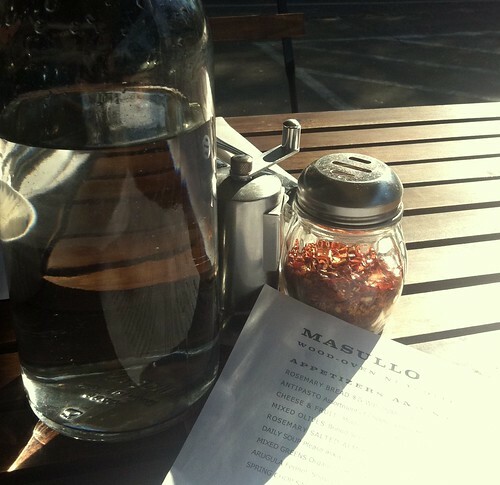 Masullo is a gem hidden in a quiet, land park neighborhood. The bright small space is elegantly designed with sleek wood tables and simple white lights. The star of the restaurant is the wood burning oven which is placed in plain view in the back. We arrive and are greeted by a friendly, elderly gentleman. 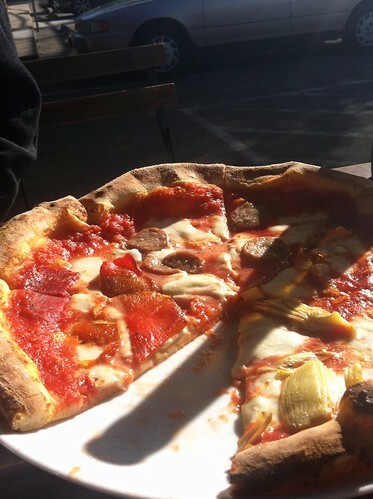 He informs us that the owner was so passionate about recreating the Neapolitan pizza experience that he took multiple trips to Naples to learn the techniques. 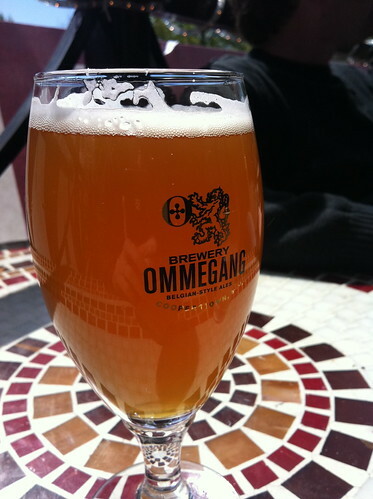 The beverage menu listed a great variety of craft beers, wines, and juices. 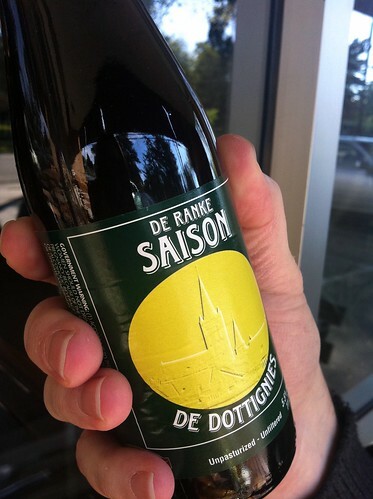 I tried the local Two Rivers Apple Cider and Simon tried a Saison Farm Ale. The appetizer menu consisted an assortment of simple, fresh small plates like soup, salad, olives and cheese plates. 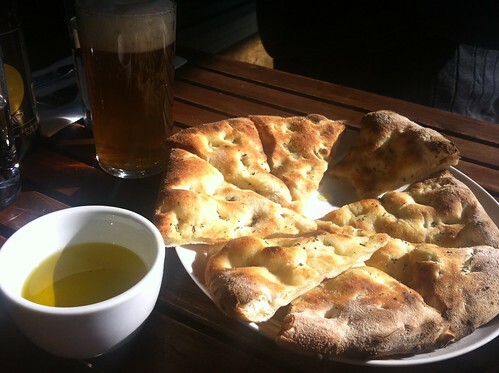 We settled for the rosemary bread with a local award winning olive oil. The bread was divine, it was a perfect texture with a light, buttery flavor. The pizza choices included standard pizzas like Margherita (mozzarella, basil), American (pepperoni, mozzarella), and others. There were less conventional choices like potato, blue cheese, and arugula. We went with the pizza called Four Quarters. 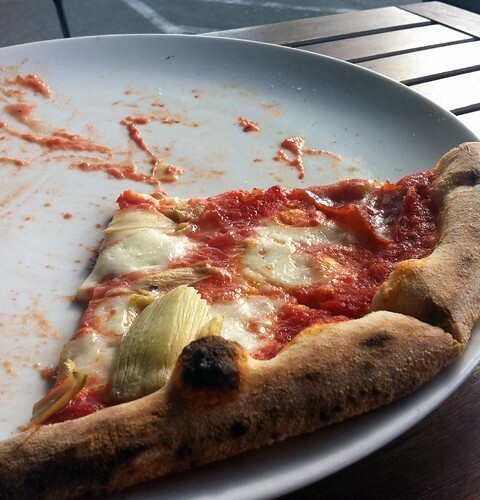 The pizza appeared with a delicate, thin crust and oozing fresh slices of mozzarella. The sauce was light and flavorful. 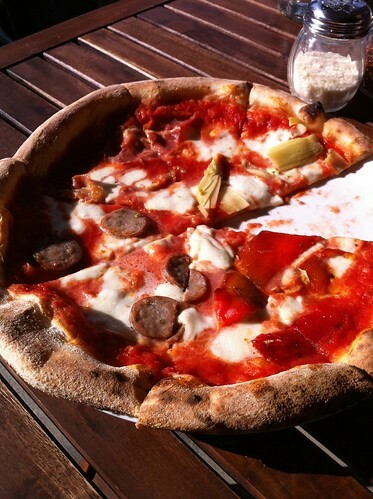 The toppings of sausage, roasted pepper, artichoke and prosciutto were split into four quarters of the pizza. It was a fantastic way to end the day. 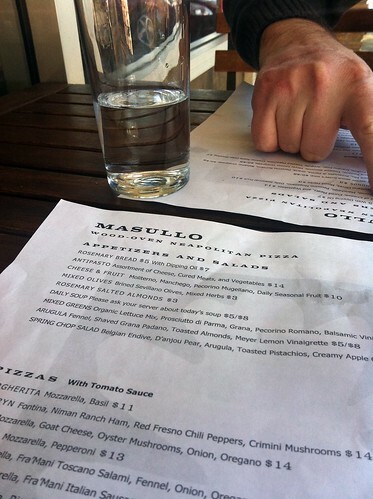 We will be happily returning to Masullo Pizza.